Lauren Patten (standing) and the cast of The Wolves. Photo by Daniel J. Vasquez. 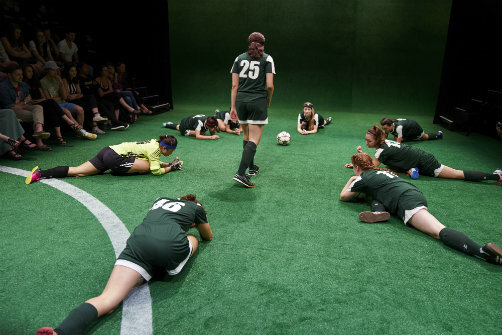 BOTTOM LINE: Sarah DeLappe's fantastic Off Broadway debut is a hilarious and emotional portrait of teenage girls discovering who they are, on and off the soccer field. #46 is the awkward new girl. #2’s family is weirdly religious. #7 is sarcastic and too cool for school. #25 is the captain, whose dad used to be the coach. DeLappe’s characters are easily recognizable types we all have known (I was quickly able to identify the #7 in my own high school experience), but they’re all absolutely unique, and everything that comes out of their mouths feels real and unrehearsed. The way teenagers speak is not easy to capture, but DeLappe is clearly fluent in teen-girl-speak. Facts about the girls and their lives spill out through natural conversation: the (unseen) coach is always hungover, some of the girls are getting their periods at the same time, #14 is Armenian (not Mexican), and where will nationals be held this year? The girls are all strong young women with distinct personalities, and are great athletes. If that were all this play was, it would be worth celebrating. Yet DeLappe’s play goes even deeper into the relationships between young women, how these relationships change through hardships large and small, and what you learn as you grow older. Much of the joy in The Wolves comes from watching the plot unfold, so I don’t want to spoil the details of how it all plays out. Despite some typical high school situations and conflicts, DeLappe manages to subvert expectations, as the plot never goes where you think it will. It’s constantly surprising as it manages to turn the typical high school story on its head. In addition to the writing and direction, every other aspect of The Wolves is excellent, from the cast to the design. 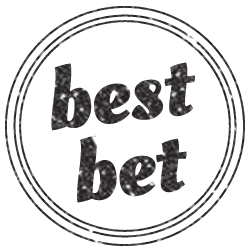 Each actress is memorable, with special mentions to Sarah Mezzanotte (#32), Tedra Millan (#46), Brenna Coates (#7), and Lauren Patten (#25). Laura Jellinek’s Astroturf design sets the stage perfectly, as do the varied uniform costumes by Ásta Bennie Hostetter. The Wolves is one of the strongest new plays I’ve seen Off Broadway in recent memory, and I can only hope that it quickly gets into the hands of young actresses all over the country. DeLappe’s voice is strong, refreshing, and certainly one to watch. The cast is Mia Barron, Brenna Coates, Jenna Dioguardi, Samia Finnerty, Midori Francis, Lizzy Jutila, Sarah Mezzanotte, Tedra Millan, Lauren Patten, and Susannah Perkins.